Why don’t we try the big knife? It seemed like a good idea. Oranges, pineapples, a blender, a pan. Not just any pan, an orange frying pan. The knife was only because the dog didn’t like to be held. We are in a gorgeous house in the Bo-Kaap and I am doing a shoot with Tshepo Moche, a young AFDA student who will graduate this November. I really wanted someone at the beginning of their career as well just to show the whole process. And I hadn’t photographed anyone in the city yet so this was a wonderful opportunity to do so. You can’t really tell by the photos that it is in the city but I know and that’s enough for now. No, we did not need the knife because the dog didn’t want to be held. The idea was for Tshepo to be this bored house wife holding smokes and a cute blond doggie. The doggie didn’t like it and the house was smoke free so we nixed the idea. I struggled a little bit with the light. I like using just natural light and I have been doing so throughout this project and didn’t want to change that. I managed though. We shot in the living room, the bathroom, the kitchen and back to the living room again. I haven’t done much all morning. Just emailed a bit, sent through interviews from last week and edited one photo. Ai. Time to go out for a run. The rest of the week will see me editing the photos from yesterday and a couple still more to do from Lauren’s shoot as well. I may do a shoot on Thursday but that’s still up in the air. I will pay a visit to the Museum Gallery once again to go over the press release and set things up properly tomorrow. I will likely meet up with Tshepo after that so we can do the Swimming Upstream interview. We never got round to it yesterday. Too many knives, oranges, coffees, baths and playing dress up to distract us. It was a cool day. 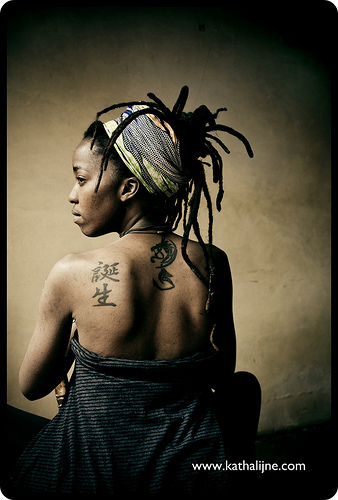 This entry was posted in exhibition, photography, Swimming Upstream and tagged AFDA, Bo-Kaap, Cait Pansegrouw, dreads, natural light, Pierre De Villiers, rastafarian lifestyle, tattoo, Tshepo Moche, video, woman. Bookmark the permalink. Love this photo – cant wait to see the rest!